Would You Qualify To Drive The President's Limo? This Driver Certainly Would! This week's newsletter is all about whether biometric security is in fact secure. We also have some responses to Ask Our Readers items from previous issues, plus the usual tips, tools, and other stuff. Enjoy! 2 weeks ago my Word files (and some other from Microsoft Office 2013) were encrypted and they are demanding ransom. The "program" was GLOBE. Any software available to "open" and read my files? Thanks. I would like to find out how other companies manage Macs on a corporate network with lots of VLANs and lots of identical printers. I'd also like to find out how Apple manages Macs and sharing of files & printers, as I don't see them having Windows servers, and there are probably no PC's outside QA testing. The slightly longer answer, is to use CIFS file shares for sharing and JAMF should be able to manage the printers as well. We must have over 100 VLANS on campus and use JAMF for nearly all management of over 1,000 Macs. Apple's Deploy Studio is still utilized to lay down the initial image. Finally, we use a Linux tool that works under BSD to join our Macs to the Active Directory to allow the Macs to use the common Activate Directory for Kerberos authentication. The Active Directory authentication also helps with having common tokens for connecting to files shares on either SANs, Windows file servers, or Linux file servers. Universities tend to be seriously heterogeneous environments. Touch wood we haven't had any go missing but we did trial one and bricked it. We've around 100 MacBooks in the estate and 1350 Windows 8 tablets. We're now looking at using it on our Windows laptop estate (around 800). No real point in using it on desktops (Mac or Win). Only downside is there's no agent for iOS but we've very few of those and the only new project I'm aware of may end up with Android (costs as much as anything) as it's a simple web browser app for workforce management. As far as Casper [JAMF] is concerned we probably don't use it to its fullest extent. Basically it sits on 3 Windows servers (2012R2), 1 primary point and 2 software distribution points. We do actually have an OS X server that we were going to 'PXE' boot (not called that in Apple terminology) from but we found it quicker to build from a bootable USB. Basically that pulls down an OS X image (10.11 in our case) and then does a task sequence (customisable) of app installs. It also adds the Mac into AD and puts it into the correct OU (we use FileVault on MacBooks (equivalent of BitLocker) but not on Mac Pros/iMacs. We also use it for custom login screens/messages and then primarily as a self-service portal so users can select the correct printers, install apps that aren't common across the board etc. There are a lot of companies out there that would benefit from knowing how to do this and the costs involved. In one episode Tom Hiddleston's character uses his cellphone to perform biometric authentication (iris scanning) for transferring $300,000,000 to a bank in Luxembourg. This got me thinking. Would I trust an iris scan alone for authenticating the transfer an amount anywhere near that large from my own bank account? How secure is iris scan authentication, really? Then I remembered another movie (maybe by Tom Cruise?) where the character used a device that displayed a collection of different iris patterns in rapid succession to defeat an iris scanner. The character simply held the device up against the scanner and turned in on, and in about 10 seconds the scanner responded with positive authentication and let the character into the secure facility to do whatever he was planning to do--steal something, I imagine. I wondered, could this actually work? Could one create a catalog or database of "base iris patterns" that would have a high probability of fooling an iris scanner in a reasonable amount of time? With MasterPrints derived from real human fingerprints, the team reported successfully matching between 26 and 65 percent of users, depending on how many partial fingerprint impressions were stored for each user and assuming a maximum number of five attempts per authentication. In other words, by creating a database of base partial fingerprint patterns, the researchers were able to fool cellphone fingerprint readers a good chunk of the time. So if it can be done with fingerprints, it can probably be done with iris scanners too. Now let's bring it home. Rod Trent's site myITforum recently informed us that "One of the promised updates to Cortana in Windows 10 Creators Update is the ability to manage the shutdown, restart and locking of your device." Okay, now let's pretend I'm Tom Cruise or whoever and I'm faced with the impossible mission of trying to unlock a Windows 10 computer so I can abort the launch of a missile that is likely to start World War Three. Leaning over the screen I shout, "Hey, Cortana, unlock my computer!" Nothing happens. "Cortana! Please unlock my computer! Unlock my computer now!!" No response, the clock is ticking. Then Ving Rhames sidles over and says, "Here, let me try." He then presses a button on his cellphone and from phone's tiny speaker comes a rapid-fire stream of "base voiceprint patterns" repeating the words "Hey Cortana unlock my computer" in rapid succession, each voice sounding different from the rest in terms of gender, age, ethnicity, etc. Tom stares on anxiously while Ving seems almost relaxed. Then just before the missile launch sequence activates, the Windows 10 computer responds with "Unlocking your computer" and once again Tom (or actually Ving) saves the world. Could it be possible to hack a voiceprint authentication system like this? Could it be possible to collect or generate a set of "base voiceprint patterns" such that one of them would have a good chance of defeating a voiceprint authentication system that has been "trained" to identify a certain individual? I think, why not? After all, there must be a lot of variables and assumptions that go into how a real-world voice authenticator works since people don't always speak a phrase with the same clarity or tonality or speed etc. I haven't studied the actual mechanics of how voice authentication systems work but I imagine they work with some set of partial identifiers like how sibilant consonants are articulated or the tonal range and length of certain vowel sounds, so compiling a catalog of all possible permutations of a subset of such partial identifiers could have a good probability of fooling how voice authentication systems work, especially ones implemented in personal computing devices that have relatively limited processing capabilities. Need help with managing, monitoring and maintaining web and mobile apps in Microsoft Azure? Watch this course to learn the basics of Azure websites and mobile services, and how to manage them using the UI, PowerShell and external tools. With our expert instructor, Corey Hynes, you'll compare and contrast infrastructure as a service (IaaS) and platform as a service (PaaS), explore app deployment options with Azure App Service, and get an overview of Azure mobile apps in Azure. 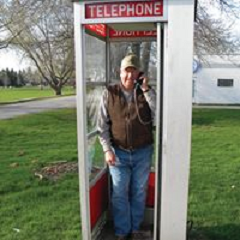 Peter Ackerman wrote a children's book in 2010 called "The Lonely Phonebooth" about one of only four remaining outdoor phone booths in all of Manhattan. When was the last time you saw a phonebooth? And when was the last time you *used* a phonebooth? The one in Kelly Iowa. I was there couple of years ago. I used it just to take pictures. Fact: The appropriate response to 'How are you?' in Luxembourgish is 'Tip-Top'. Question: How do *you* usually respond when someone asks "How are you"? Why do you respond that way? Hint: I usually feel uncomfortable when someone asks me how I am as it throws me into a moral dilemma i.e. should I answer honestly or just return a meaningless pleasantry? The Expert Guide to VMware Disaster Recovery and Data Protection by Mike Preston. Enable always-on operations shifting from backup and recovery to Availability. Despite problems, is Microsoft retiring its EMET security tool too soon? According to WikiLeaks, the CIA and others can bypass Microsoft's soon-to-be-retired EMET security tool. Does this leave you vulnerable to attackers? Migrating from VMware to Hyper-V is becoming common. But common doesn't mean easy. Follow this guide and you can accomplish the task without too much pain. With some help from a Senior Premiere Field Engineer (PFE) at Microsoft we re-examine Server Manager in this article and learn why sysadmins may want to give this tool another look.